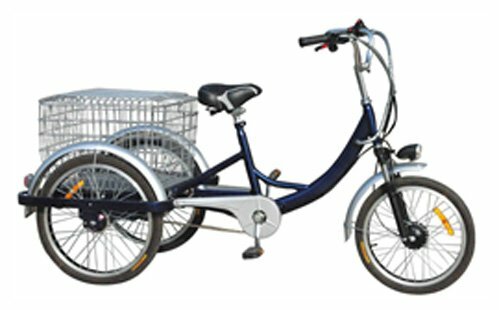 The Supersized Tri-Cruiser is a great option for people who want a tricycle with an electric motor. While the traditional bike can support 325 pounds, we've found a lot of bigger riders who want the fun and fitness options provided by this tricycle. A few upgrades have made a big difference in their safety on this bike. Our upgrade includes changing the handlebar stem for you can adjust the handlebars to the height that is most comfortable for you. We also replace the grips (where you hold on to the handlebars), so they're softer and easier on your hands. The seat has been replaced with a super padded, gel-filled seat that is extremely comfortable. The final, and vital, improvement is an upgrade on the pedals. We might not think about them much, but it is important that the pedals be very strong and are also wide enough for our rider's feet. The pedals included in the upgrade are everything required, and then some. Some advanced assembly required. Electric Bikes Practical & Comfortable 20 Mi Range 15+ MPH 250W Rear Hub Motor Drive 20+ Mile Range 12-20+ MPH NEW Electric Cargo Tricycle Styled like a traditional Bike, this Electric Tricycle boasts a Steel Frame with Lead Acid Batteries and a large cargo basket that measures 20" x 22" x 15" High. The S27 Cargo tricycle is the ideal bike to transport groceries from your nearby market. 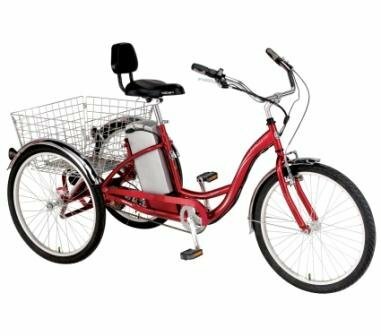 Partially Assembled, add the front wheel and secure the basket and you are ready to ride.. You may also pick these bikes up at our store in Hemet Product Specifications: 36 Volt 10 AH, 250 Watt Brushless Rear Hub Motor, 1:1 Pedal assist crank, Wheel Size 20" x 1.75" front and 22" x 1.75" rear standard bicycle tires and tubes, Range 20 miles between charges, Speed 12+ MPH, Net Weight 90 pounds Weight Capacity 250 pounds Hill Climbing up to 12 degrees Electric assist brake system Front and Rear suspension. This Electric Tricycle is available in Red or Blue.